Welcome to our March Update! Hope you enjoyed the half term and are ready for Spring! WAAD - As you will know for 2015 we are putting on a bigger event with three talks, local providers and national organisations taking part. Please do book as soon as possible (details below) as places are going fast. We are looking forward to bringing another great autism awareness event to Kingston - spread the word! HUSTINGS - As part of the NAS I'm One General Election Campaign we have been busy organising a hustings! This is a unique opportunity for a large number of us to raise our concerns and have our issues heard together by candidates from different political parties. Please see further details below. - So exciting!! We would just like to say a big thank you to M&S Tolworth for their support & fundraising, especially Joe Hewlett. We received a cheque for just over £500 raised at their bikeathon. Much appreciated. Express CIC World Autism Awareness Day 2015! Over the last few years Express has put on events for the UN designated World Autism Awareness Day to help raise awareness in the community. For April 2nd 2015 we are going even bigger! We have organised a morning of events at The Rose Theatre, Kingston upon Thames. Thursday 2nd April 10:30am - 13:00pm. Saskia Baron - documentary film maker, credits include The Autism Puzzle (BBC2). Sakia's father Michael Baron is one of the founder parents of the National Autistic Society. She will talk about her big brother Timothy growing older with autism. The spaces on the talks are limited so please book your tickets as soon as possible. If you do not manage to get a place at one of our talks there is still plenty of information to share on the day and as always, refreshments will be available. Book using the link below. Please ensure you click through to eventbrite to confirm your tickets. EXPRESS WAAD - 2nd April 2015, Kingston. We look forward to a great day raising awareness, providing & sharing information and establishing support networks. The evening will be chaired by John Williams, parent, author and comedian - My Son's Not Rainman. The focus of the evening will be on autism, SEND legislation and there will be an opportunity for you to ask questions of your prospective parliamentary candidates for Kingston & Surbiton. The first National music festival exclusively for those with learning disabilities. If you have a learning disability and/or autism, New Forest Spectrum is the English music festival for you, your family and care staff. The festival is for all ages click here for more information and tickets. Ever experienced this? - Read what one mother had to say. M Kelter was diagnosed with Asperger's Syndrome at the age of 30. He now writes about life on the Autism Spectrum, focusing on: childhood and adolescent experiences with mindblindess, depression and what it was like teaching himself to use body language. Read his bloghere. Cyberbullying and children and young people with SEN anddisabilities: guidance for teachers and other professionals.The Anti-bullying Alliance is a coalition of organisations and individuals working together to stop bullying and create safe environments in which children and young people can live, grow, play and learn.Information with reference to the change in the administration of the Children with Disabilities Register.Should you need to renew your iCount card please email tracy.florentine@achievingforchildren.org.uk Please click here to read the letter. The consultation asks for your views on changes to the way care and support is funded, through the introduction of a cap on care costs. It also seeks views on proposals for a new system of appeals. For more information click here. 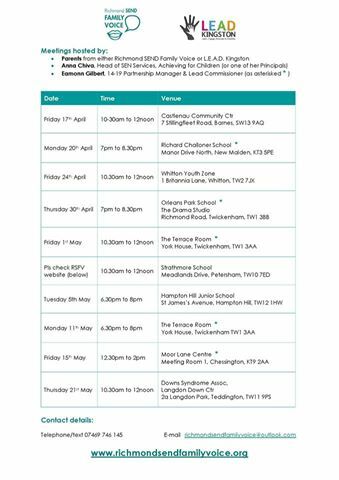 Mencap are organising free wills & trusts events see theirwebsite to find one near you. The seminars will be presented by a specialist legal professional who will talk about how best to leave money behind to someone with a learning disability. 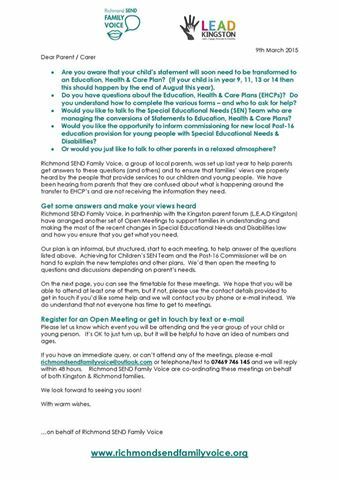 It is an opportunity for families/carers to get straightforward, face-to-face advice.